1. Lancome Hypnose Mascara: A lot of people believe that Lancome makes the best mascara and let me just say, I am one of those believers. This mascara gives me exceptional volume and length and never clumps. Nuff said. 2. Physicians Formula Eye Booster in Ultra Black: I've never worn too much black eyeliner in my life until recently where I now wear it about once a week. This is one of those products that I bought a long time ago and only now started using. This liquid eyeliner has a very fine tip which is great for creating a thin line and it stays in place. It goes on very smoothly and easily and has a great, dark pigmentation. 3. Elf HD Blush in Headliner: This product has been part of my daily makeup routine for a couple of years now and I own it in several shades. I've been using the light pink Headliner shade for the month of March because let's face it, my skin is at its most pale right now. This creamy blush is perfect if your skin is on the dryer side like mine. I find this blush lasts all day unlike many powdered blushes and it also has great pigmentation. 4. 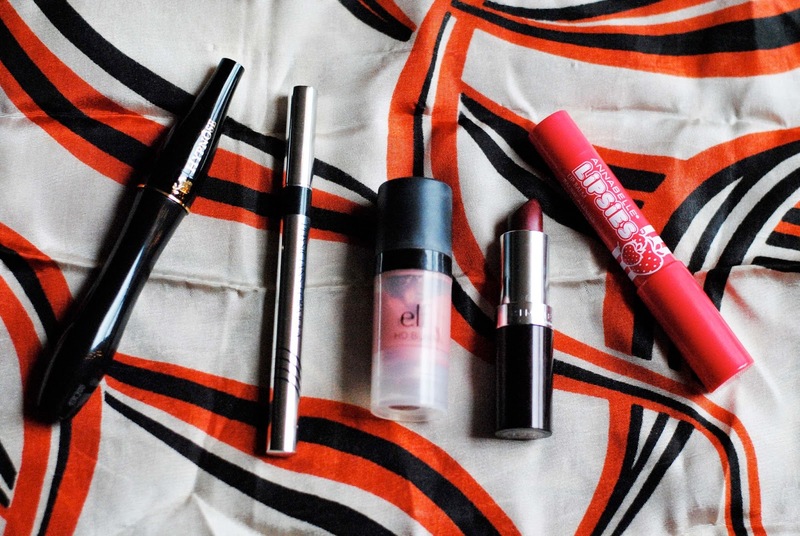 Rimmel lipstick in Bordeaux: In Jackie's recent post, she reviewed a ton of her go-to lipstick's because she is indeed, our resident lipstick guru. I always go to her for lipstick advice and this was one of her recommendations taking into account my recent affection for dark red/burgundy lip shades. If, like me, you are a little uncomfortable with a classic bright red lip, this is a must try. 5. Annabelle Lipsies Strawberry: This is a great everyday gloss that just adds a little girly glam to your face. It has a thick crayon-like applicator and is very glossy with a nice reddish hue. A great lil pick me up when your lips are feeling sad.